Red Velvet have already established themselves as one of the leading K-pop girl groups in America, and now the quintet look to make good on that promise with a full-fledged tour. 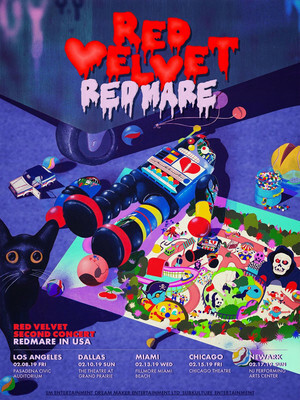 Chart-Topping K-pop Group Red Velvet Embark on redmare tour! K-pop five-piece Red Velvet embark on a highly anticipated US tour in 2019! The band has been successful ever since the release of their Gaon Album Chart-topping EP 'Ice Cream Cake' in 2015. Later, their first full-length album 'The Red' also reached number one on the Gaon Album Chart, and the band's 2017 'The Red Summer' topped the Billboard World Albums Chart. The fivesome have gained wide recognition and praise for their music both at home and internationally. In 2017 they received the Golden Disc New Artist Award and the Mnet Asian Music Award for Best Female Group. Seen Red Velvet? Loved it? Hated it? Sound good to you? Share this page on social media and let your friends know about Red Velvet at Fillmore Miami Beach. Please note: The term Fillmore Miami Beach and/or Red Velvet as well as all associated graphics, logos, and/or other trademarks, tradenames or copyrights are the property of the Fillmore Miami Beach and/or Red Velvet and are used herein for factual descriptive purposes only. We are in no way associated with or authorized by the Fillmore Miami Beach and/or Red Velvet and neither that entity nor any of its affiliates have licensed or endorsed us to sell tickets, goods and or services in conjunction with their events.